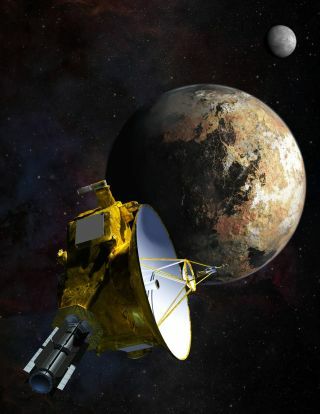 An artist's illustration of NASA’s New Horizons spacecraft as it approaches Pluto. Pluto's largest moon, Charon, hovers in the background. The world will get its first up-close looks at Pluto today (July 15). Early this morning, NASA's New Horizons spacecraft will beam home the first haul of photos and other data it collected during Tuesday morning's (July 14) historic Pluto flyby. The space agency plans to unveil some of the best images during a news conference today at 3 p.m. EDT (1900 GMT); you can watch it live here at Space.com, courtesy of NASA TV. "Additionally, there'll be information from the two spectrometers — from Alice and from the Ralph spectrometer — new color data, information on not just Pluto but also Charon and the small satellites," added Stern, who's based at the Southwest Research Institute in Boulder, Colorado. "So there's going to be quite a waterfall of data for us tomorrow morning." New Horizons zoomed within 7,800 miles (12,500 kilometers) of Pluto's surface at 7:49 a.m. EDT (1149 GMT) Tuesday, using its seven science instruments to gather a variety of data about the dwarf planet and its five known moons (Charon, Nix, Hydra, Kerberos and Styx). The probe was so busy making observations that it didn't check in with mission control until nearly 9 p.m. EDT Tuesday (0100 GMT today). (New Horizons cannot communicate with Earth and collect data at the same time.) And that message was merely a status update telling the mission team that the close encounter went well; as soon as the spacecraft fired off that missive, it went back to its science work. So New Horizons' handlers and NASA officials are understandably excited about this morning's data dump, which is scheduled to begin around 5:50 a.m. EDT (0950 GMT) and last for several hours. "If you think it [the news] was big today, wait until tomorrow and the next day," former astronaut John Grunsfeld, associate adminstrator of NASA's Science Mission Directorate, said during Tuesday night's press conference. "We haven't seen anything yet. This is really just the beginning." Indeed, New Horizons will still collect more data about the Pluto system; the probe will be in "encounter mode" through Thursday (July 16). And it will take up to 16 months for New Horizons to send all of its data back home to Earth. The completion of that task may not mark the end of the spacecraft's work, either: Stern and other New Horizon team members have said they want to fly by another object in the faraway Kuiper Belt, the realm of icy bodies beyond Neptune's orbit. This second flyby would likely take place in 2019, if NASA approves and funds the extended mission.